The Barn Swallow (Hirundo rustica) is one of the most widespread and popular birds. Most everyone with an eye for the natural world can recognize them and has a name for it, often a name used only at the regional level. 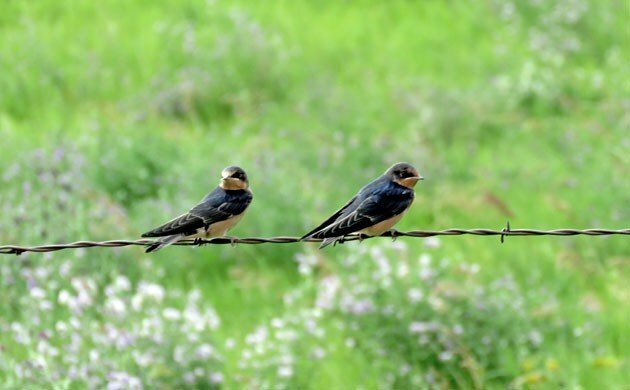 Many literary references are based on the Barn Swallow’s migration as a symbol of a change in seasons. They are easy to notice and seem rather consistent regarding the time or arrival at the many regions and countries they fly through. Growing up in South America, I distinctly recall the arrival of “the swallow with a deeply forked tail”. Their speedy, yet effortless flight near the ground and sudden nearly vertical change in flight trajectory and maneuver to catch an insect continue to be be captivating. They are still among the coolest birds on my list. Nest at Blue Mounds State Park, Minnesota. Photo Alfredo Begazo. 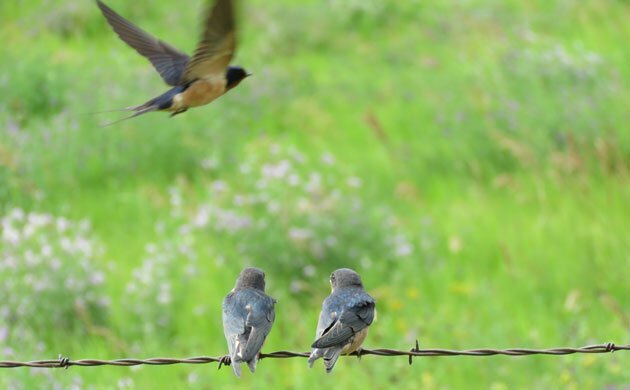 I later learned about the Barn Swallow’s amazing annual migration. They fly from extreme northern North America to the southern tip of South America and are seldom seen perched during migration. Another cool fact was learning that the Barn Swallows has started to breed in South America since the 80s. This is quite a remarkable fact if one thinks that this is the only (and first to do this) migratory bird to change its breeding and migratory habits. Swallows have migrated north to south along the Americas for millennia. 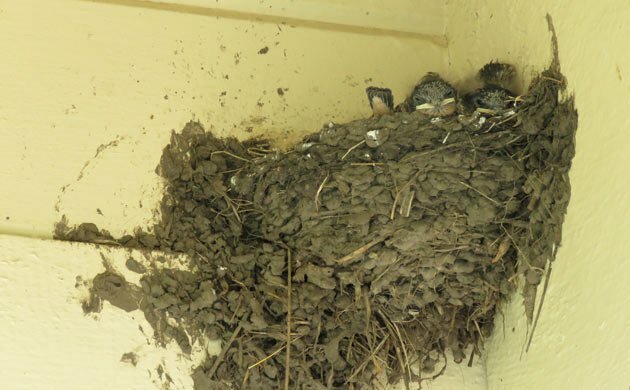 Suddenly a group of barn swallows hatched in a barn or underpass in North America decides to stay in the wintering grounds and start a breeding colony there. What prompted this amazing change is still unknown. What is known is that the colony in South America continues to grow as birds hatched there stay and breed there. Some also suggest that additional birds hatched in north America appear to continue to stay and join the group of birds nesting in South America. There are other species of migratory birds that have a breeding population in the Neotropics and a separate migratory population. What is remarkable here is that we are witnessing this change in our lifetime. 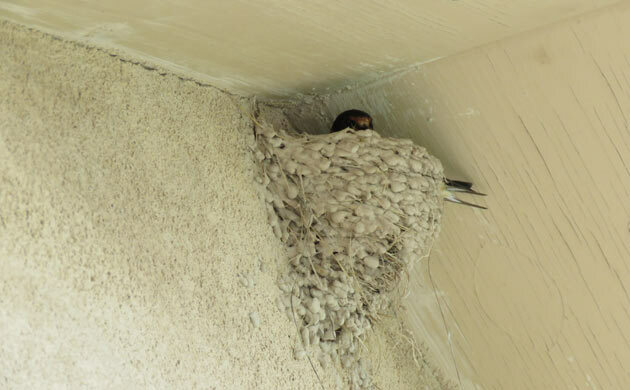 Another fact I found fascinating about Barn Swallows is their nest building. 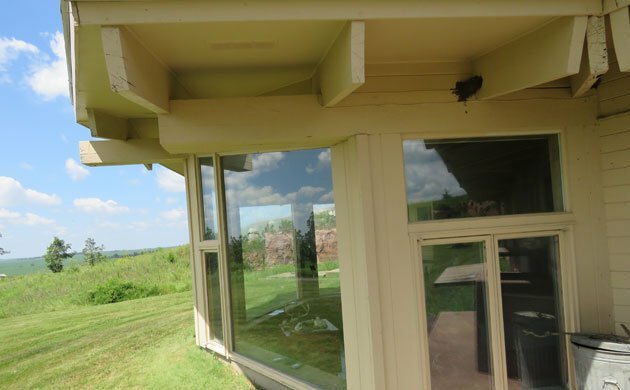 For someone who grew up where Barn Swallows breed, a nest in a barn or other structure may be a routine sighting. From pictures I saw, I thought a nest built using mud and looking like bricks neatly stacked was rather unique. But, seeing a actual barn swallow nest would imply either going to central Argentina or travel to northern latitudes during the breeding season. Chicks in nest in Wyoming. Photo: Alfredo Begazo. This summer the opportunity presented itself in the form of a family trip to South Dakota and neighboring states. The goals were visiting Mount Rushmore and the Crazy Horse Monument. A great added bonus was seeing Barn Swallows in their wintering grounds; and there were a lot of them. “Be careful what you wish for”, the swallow was by far the most common bird in the region. I spotted the unmistakable cups on just about any suitable structure. There were many swallows at the many overpasses we went under, entering and exiting barns and building; a sure sign that an active nest was likely there. The swallows looked better than ever. They seemed to have shinier plumages and longer forked tails than what they seem to show in the wintering grounds. This is explained by the fact that males with longer outer tail feathers appear to be favored by females during pair forming. While I maintain a poorly kept life list, I enjoy learning about basic facts about the natural history of the birds I have seen. I can claim now I’ve seen Barn Swallows during migration, in the wintering grounds, incubating, nestlings, hatchlings, birds in various plumages, and Barn Swallows with some of the most amazing backdrops including Mt Rushmore and the monument to Native American Chief Crazy Horze, which I found to be jaw dropping. I still have to see Barn Swallows nesting on the Southern Hemisphere. Thanks for a great post! Sometimes our most common birds are the most fascinating, and I learned a lot I hadn’t known from your post. Glad you enjoyed the post Wendy! Birding tends to highlight vagrant, rare, and unusual birds. Some of our most common birds have fascinating life histories.